Heroine Daisy Richards, with her “empty pinned up sleeve,” after a terrible runaway-horses-and-wagon accident, though fragile, frightened, and angry-sad, finds a way, with the help and support of the eponymous cowboy-hero, Ricky White, to embrace a full life. She learns to be strong and laugh again. Ricky (again with that unfortunate choice of name for a hero; what’s wrong with Rick? ), former gambler, drinker, brawler, and promiscuous, with a new-found faith in God’s redemptive power, excavates the goodness that has been in him all along by helping and loving Daisy. As Daisy gains in confidence and begins to return Ricky’s feelings, what she doesn’t know is that he’s implicated in her accident. Williams sets a great, family-in-transition opening scene: Daisy, now physically recovered from the loss of her arm, still emotionally vulnerable, sullenly attends her father’s wedding with her younger sister, Belinda, and Audra’s, her father’s soon-to-be wife and her step-mother, twin sons from her first marriage, Terrance and Todd. Also present are her Uncle Ned, and two hired cowboys: Beau and the man with the “unusual steel-gray eyes,” Ricky White. Other than the genuinely engaging romance in Williams’ novel are the strong secondary characters. Owen, Daisy’s father, though a vague figure for most of the novel, shows a steely spine when he, near the end, judges Ricky’s suit harshly but fairly. Audra too is hard, hard on Daisy, but not uncaring, insisting that Daisy re-enter life, re-enter, in particular, the social life of the town, see her friends, and attempt household chores. Nevertheless, Audra proves herself to be a caring, if not loving, stepmother. Her twins are unholy terrors, as twelve-year-old boys are wont to be. Daisy has a terrible time with them when Owen and Audra’s honeymoon leaves them to her and Belinda’s care. They stare at her truncated arm, tease and disobey her at every turn. Secondary characters are not all sun-shine and light and Daisy’s relationship with them remains strained, even while they care for her and she for them. Miss Bates loved that, unlike many inspirational romances, relationships can remain difficult even for a life-time. They felt real, believable. She thought this basically caring, steadfast, but NOT PERFECT family one of the novel’s strengths … among many others, which include Ricky’s more loving, more supportive, more understanding family. What Daisy doesn’t know in that opening scene is that Ricky White knows he “was responsible for what had happened to her. He’d been drunk that night in Pattonville.” He caused the animals’ spooking and bolting. He doesn’t give himself credit for also sticking around to save Daisy from where she was pinned under the wagon. While she lay ill from infection, and then sequestered for months to be well enough to join the family, Ricky asked to work for her father, not returning to his own family (his father, Jonas, makes an appearance and provides a wonderful, key confession scene for Ricky). Ricky works at the Richards’ farm as a form of penance, hoping that he’ll be able to make up for what he did to Daisy, “with God’s help, he was going to make it right.” And, he does – in all manner of beautifully rendered ways. He is gentle, loving, kind, but never patronizing, or pitying of Daisy. He offers friendship and support; he offers help, but gives her the confidence, by inventive and sensitive means, to learn to do for herself. Audra, for example, wants no less for her, but she never shows Daisy how to reintegrate into life and her community, just tells her to. Audra is “snap out of it,” while Ricky is “here’s how you can still do this, but differently.” He recognizes the healing power of animals and gently lures Daisy into the barn where he helps her ride her horse, Prince, and spend time with a beloved family dog, Matilda. As Daisy gains in confidence, her beauty, intelligence, and strength shine. There’s a stunning, banter-full, and romantic scene of Ricky and Daisy finding and cutting a Christmas tree … also, a snowball fight. Normality for Daisy; delight for Ricky. Ricky is charmed and begins to fall in love … but feels undeserving in light of his role in the accident that has led to Daisy’s present difficult, if not hopeless, state. What unites Ricky and Daisy, though neither confess it to the other, is shame. Shame is such a common, secretive human emotion that it resonated with Miss Bates. Daisy is ashamed of her appearance, yes, but also her inability to be who she was: a beautiful 20-year-old girl, with a loving father, who was ready to be courted, take on her father’s ranch, have a family. Suddenly, she is less than and this shames her; she has isolated herself on the ranch. Ricky cajoles, charms, and gentles her into re-entering the life of her family and community, returning to the things she loved, or wanted to be able to do, simple things like pour water out of pitcher, do laundry, or cut a slice of bread. Miss Bates thought about another strength to this novel: its portrayal of faith and how faith is manifested quite differently in the two protagonists. Daisy has experienced a life-changing accident; she has to re-adjust her life to her injury. Her life can be full and good, but it has to be different. And yet, Daisy never seems to engage, or interact with God: she’s not angry at Him, nor does she request His Help, or Comfort. Her faith is part of her everyday life, her culture, in the same way that running a ranch is. Her initial reluctance to return to church is about how her friends and community see her. Her internal ruminations are never a conversation with God, or prayer: they’re very much about her struggle to adjust to her injury, live her life well, to gain confidence, to not be so darn sad and angry about her amputation. However, when she does return to church, she enacts one gesture at the service that is truly what being a Christian is about. It seems to Miss Bates that the faith journey of the novel lies more with Ricky’s character who, unlike Daisy, engages with God, keeps Him in his heart and head. Ricky tries to discern God’s Will and follow it; he “sees through a glass darkly,” but he’s ever looking to his Saviour for answers. He is a newly-made Christian, a convert in his way, not from one faith to another, but from unbelief to belief and trust. Ricky’s confession is so heartfelt. His physical response, his body (in the swallow and chest-tightening) stand in for his intense emotions. And Daisy, silent and standing, with that beautiful image of the swirling snow, she returns her vulnerability for his. Williams evokes the newness of these beautiful young people’s feelings for each other: their burgeoning love from simple caring friendship. Miss Bates loved Lacy Williams’ A Cowboy For Christmas and in it found that “there is no charm equal to tenderness of heart, Emma. 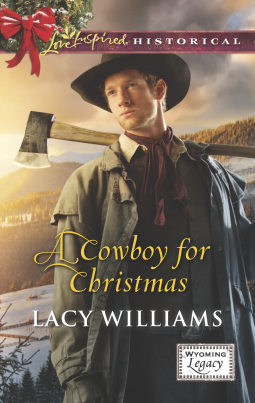 Lacy Williams’ A Cowboy For Christmas, published by Harlequin (“Love Inspired Historical”) has been available since December 2nd at your favourite vendors in your preferred formats. Miss Bates received an e-ARC from Harlequin Books, via Netgalley. With this concluding review, Miss Bates hopes you’ve enjoyed her Christmas romance posts and will return for more of the same in November and December of 2015. Man, you write good reviews. I didn’t really analyze the portrayal of faith in this story – but you’re so right. It’s striking, as you point out, how Daisy’s faith is integrated so well into “who she is” and her “everyday life.” Now that you’ve mentioned it – I’m glad the author didn’t go down the obvious path of making Daisy “angry with God.” While she is scared, ashamed and unsure of herself – we are spared a lot of “Why mes!! !” from her character, which I think gave her growth over the course of the story added punch. Also, best opening scene I’ve read in a while. That family wedding opening was really well done. Yes, I think increasingly, because I have finally learned to say “never say never” (I’m looking at you Netgalley addiction), I’ll continue to read inspirational romance, an inspie’s portrayal of the characters’ faith journey is something to consider for me. The inspirational conventions can be as trite as the romantic suspense, or contemporary small-town, or historical dukes. Genre fiction is subject to trite BIG-TIME because … well, there is a formula and, while it’s a good one, it can be just that, formulaic. However, the sonnet has a rhyme scheme, etc. too and look at what Shakespeare did with it, or Donne, or my modern personal favourite, Edna St. Vincent Millay (yay for women’s poetry!). It’s important to look at HOW a romance writer works WITH convention … not to dismiss the convention itself, but only its individual manifestations. Which probably means I’ll need to break down some personal reading barriers this year! Yes! That opening scene was so good: succinct in setting up characters with their quirks, conflict, context, but also suspense, curiosity in reader. Williams is also good at giving you piecemeal information, building your interest. And she sure can set a scene: the church scene and social are also great ensemble pieces, loved that “coughing baby” bit.